Hi Bri, nice to meet you. Thanks for the welcome. I am also a very bad practical jokester, haha. I usually start giggling beforehand and than people will know something is up. Plus I'm not very creative and origional when it comes to jokes. And you're right, April Fool's day would be one of Emmet's favorite celebrations. ...Un.....HI EVERYBODY!!! *jumps up and down* It's been sooooooooooooooooooooooooooooo*breath*ooooooooooooooo long!!! I see alot of the oc's been visiting! Well, here I am!!!!! *bows* And to many of the new folks, the name is Meztli! Or Mez to make your life easier. I was so happy to see the oc is back. Cam, Syd, and the like. Exciting!! And we have questions! If you could had the opportunity to be with Emmett for say 4 hours & could talk to him about anything what would you ask? This is a good question! Someone answered it really well by asking about the time that Emmett killed his first human and how it felt to face Rose. That was a good one. What about having to face Carlisle? Or Esme? Those are something to think about. What do you suppose Emmett's favorite food was as a human? Mama's food. You can't beat Mama's cooking. Steak, potatoes, corn. Sounds like Thanksgiving. I would think as a general rule Emmett doesn't refuse food but I'm sure his Mom's cooking was his favorite. What instrument would Emmett play? Something like that. I paraphrase ALOT! DRUMS!! He seems like a drum person. If he doesn't have to be particularly delicate with the instruments then that's it for him. Though I imagine he likes to play around with Edward's piano. I've got a couple questions to ask that I've thought about. 1) If Bella & Edward asked him to do you think he really would have got a clerical liscence off the internet to marry them? (Whatever it is you get to do that.) And would he have done it? Were you disappointed when you first read Breaking Dawn that he didn't marry them? I for one think it would have been awesome & hilarious if he did. But I think Bella says/thinks at one point that she probably would have a hard time not giggling through the ceremony if he did though. So it probably is a good thing he didn't. 2) If Rosalie hadn't sided w/Bella on keeping her little nudger what stance do you think Emmett would have taken? This one I'm not too sure so I want some input. Hi Meztli! Nice to meet you! I'm just stopping by to answer the new questions, which are great btw, good thinking! 1) If Bella & Edward asked him to do you think he really would have got a clerical liscence off the internet to marry them? And would he have done it? Were you disappointed when you first read Breaking Dawn that he didn't marry them? But I guess it is also symbolic for a human to marry them. Bella has said that she wanted to tie herself to Edward in every way humanly possible before becoming a vampire and Edward (being his 105(at the time of the wedding if I calculated correctly. Huh, calls herself a fan but doesn't even know how old Edward is )-years-old-self) wanted a traditional wedding the way his life with Bella would have been if they lived in that time. So I think it's nice for them to ignore that they are vampire-and-human and just be Edward-and-Bella and have a normal wedding. If you know what I mean. Anyway, back to Emmett. I think he would have definitely married them if they asked him to. Yes, he would have made a few jokes but I also think that we (including Bella) don't give him enough credit sometimes. Besides being funny, he is also very loving and friendly and can be quite serious and considerate of other people's feelings. I think he wouldn't kid around if the timing wasn't appropriate. So if they asked him to, he would keep it serious and sweet and romantic. In my opinion anyway. Besides, I don't think that perfect-wedding-planner-Alice would have let him joke around! Though he might make a joke about that when he starts his speech. 2) If Rosalie hadn't sided w/Bella on keeping her little nudger what stance do you think Emmett would have taken? This is a hard one. I think he would have been thrilled about becoming an uncle but he would have been very concerned for Bella as well. Emmet loves Bella as a sister and I think he would agree that it was dangerous, although I don't know if he would side with Edward and Carlisle and force Bella into abortion. If Bella could convince him that she really wanted her baby, then I don't think he would force her into giving it up. He certainly doesn't walk away from a challenge himself. Plus I think that he can't deny Bella anything (being the big bro to his little sis), just like Edward. The diference with Edward is that Edward is so blinded by his self-loathing and fear of losing Bella that he can't see that Bella wants her nudger, but Emmet could. Oh lordy it's been a few months sense I posted here and I feel bad! I'll come back and make a proper post soon! hi everyone! I'm loving the new emoticons, especially this one hihi. So I apologize in advance if this post is full of them. I really liked the wedding question as you can see from my way-too-long answer above. So I was thinking that we could expand on that and write his fun-loving-Emmet-style-speech for the ceremony. We could each write our own OR -which I think would be fun- someone can start and than everybody can add a little to it. What do you think? Ugh! Walking in my head down in shame. HEY EDC! I'm soooooo bad, haven't been on in ages. Walking into my office, grabbing the "RULER OF DOOM" out from my desk. Let the hand spankings begin. Welcome Suzan! I'm shannon (with 1 N or skylarblue or sky) The New Trainee Supervisor and I see that you have fit right in with the madness of our little bit of Emmett heaven. I just want to apologize to everyone for my absence but work has totally taken over my life. It seems that's all I do now. I'm really sorry. To the OC....HOLLA! I miss all of you guys. Luv ya to bits! Going to try to check in tomorrow and answer some questions. Take care my lovelies and talk to you soon. Hi shannon That RULER OF DOOM sounds scary. Am I in trouble? Question: What does "OC" mean? I'm guessing it is something like Original Characters or Original Crew but I could be way off here so please enlighten me. Jenn ~ I've never done any writing and I'm nothing like Emmet as well, but we could always give it a try, right? we are gathered here today in the presence of these witnesses, to join Edward Anthony Masen Cullen and Isabella Marie Swan in matrimony. If any person can show just cause why they may not be joined together – let them speak now or forever hold their peace. Or in plain English: Great to see you all but shut up so these two can get married already. My lovely sister Alice has requested that I keep this serious and I will try my best, but sometimes I can't help it. No worries Suzan, the ruler won't be used on you. You've been doing great! It only comes out if someone gets out of line or starts using this as a chat room and doesn't keep it Emmett related. The OC is short for Original Crew. 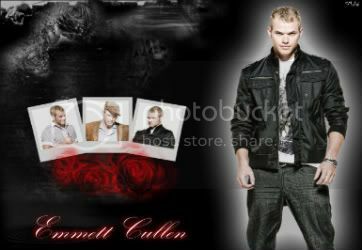 When BHG started the group, there weren't that many people who actually were interested in Emmett because everyone was falling over Edward or Jacob, so there were a few of us, that fell in love with Emmett (either in a brotherly way or more) so we built the group up and it turned from just an Emmett page into the EDC. We are a crazy bunch of people so, don't worry if one of us from posts past come on and say something don't be alarmed. Welcome to our Emmett world so enjoy the ride and believe me. We do get crazy around here. So enjoy and keep posting. HAPPY BIRTHDAY DT! LUV YA HUN!